Welcome back to Learn All About Horses. Due to circumstances that I did not control, I missed publishing the September 1, 2002 edition of this newsletter. For that I apologize and hope that this mid- September edition will hold enough interesting information to permit your forgiveness. The cool, crisp smell of Autumn is teasing our part of Texas and the heat of summer will soon be a memory. Next to Spring, this is my favorite time of year when I simply must be outside either riding or watching the horses play. Let's all take time from our busy days to enjoy the small, simple pleasures of life! Boy! Is that a mouthful! What it means is simply that the movement of the horse can improve mental and physical function in people with certain medical impairments. While this is not surprising to those of us who love horses and riding, the acceptance of horseback riding as therapeutic by the medical and mental health professionals is significant. Whether you realize it or not, you are training your horse every time you interact with him. And, those bad habits he has picked up? He may have learned from you. This article by Cheryl Sutor explains, in easy to understand language, two different methods by which handlers teach their horses both good and bad habits. Awareness of how and why your horse acts the way he does, and how you can change that behavior, increases safety and the enjoyment of being a horse owner. 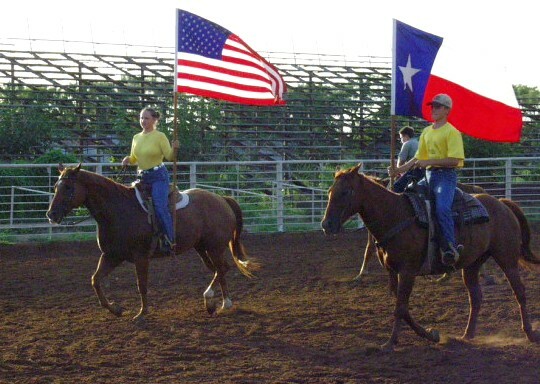 We have been taking kids and horses to the local Junior Rodeo for 24 years. Many of those years, at least one of my kids has brought home a high point buckle; always we have brought home good memories. This year, the seven kids we hauled competed in break- a-way roping, goat tying, goat sacking, calf tying, barrel racing, pole bending, and the calf scramble. Plus, four of them set pivots for the Grand Entry. The riders in this picture are Nolan, my son, on Shadow and Jamie,one of my best students, on Sly. Nolan brought home a high point buckle this year. Even though this picture was made in August, it seemed fitting for this September edition in honor of 9-11. This email was sent to nessa.rottner@sympatico.ca, by Learn All About Horses.